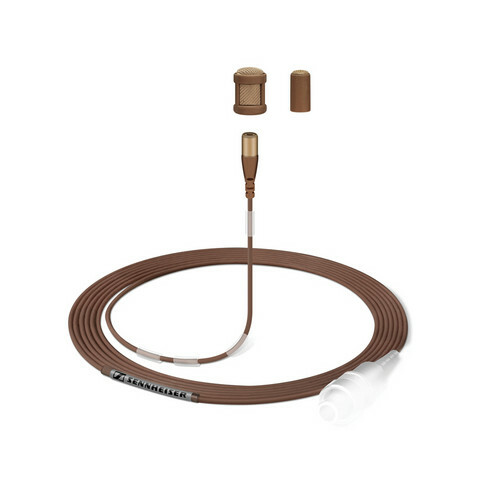 The Sennheiser MKE1 Miniature Lavalier Microphone is their smallest, professional lavalier microphone to date. Measuring just 3.3mm (0.12") in diameter, the MKE1 is well suited for placement in hair, the body, clothing, accessories, props, etc. Audio signal is reproduced transparently, while maximum intelligibility of speech and vocals is achieved with its omnidirectional polar pattern and wide frequency response. The Kevlar reinforced cable is rugged and minimizes surface noise. The MKE1's moisture resistant enclosure protects against damage caused by moisture, making it well suited for actors, performers and broadcast applications.